Refer to DTC P0115 (See page ). When either of the following conditions is met (2 trip detection logic). The monitor runs when the engine is started cold. If the change in engine coolant temperature sensor output until the engine is warmed up completely is less than the threshold, it is determined that a malfunction has occurred in the engine coolant temperature sensor. When this is detected in 2 consecutive driving cycles, the MIL is illuminated and the DTC is stored. The ECM compares the engine coolant temperature when the fully warmed up engine is stopped and when the engine is started on the next trip when more than 5 hours has elapsed since the engine was stopped. If the change in engine coolant temperature sensor output is less than the threshold, it is determined that a malfunction has occurred in the engine coolant temperature sensor. When this is detected in 2 consecutive driving cycles, the MIL is illuminated and the DTC is stored. Check that the engine coolant temperature is 60°C (140°F) or less. If the engine coolant temperature does not change by 5°C (9°F) or higher, the engine coolant temperature sensor is malfunctioning. It is not necessary to continue this procedure. If the judgment result shows INCOMPLETE or N/A, perform steps [D] and [E]. Drive the vehicle at 40 km/h (25 mph) or more for a total of 5 minutes or more [D]. In the event of the drive pattern being interrupted (possibly due to factors such as traffic conditions), the drive pattern can be resumed. Check the DTC judgment result again [E]. If the judgment result shows INCOMPLETE or N/A, perform steps [D] and [E] again. If any of DTCs P0115, P0117, P0118 or P0125 are output simultaneously with DTC P0116, the engine coolant temperature sensor may have an open or a short circuit. Troubleshoot those DTCs first. 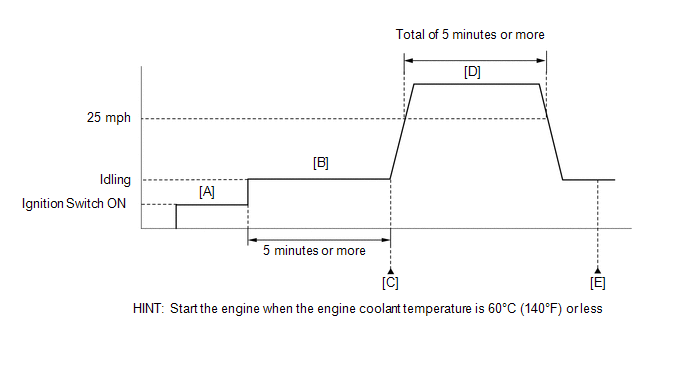 When the DTC is output, check the engine coolant temperature using the Techstream. Enter the following menus: Powertrain / Engine / Data List / Primary / Coolant Temp. If the Coolant Temp value is lower than the actual engine coolant temperature, the engine coolant temperature sensor circuit may be malfunctioning. In this case, check the wire harnesses and connectors (and those connections) between the ECM and the engine coolant temperature sensor first. If any DTCs and other than P0116 are output, troubleshoot those DTCs first.